It’s rally time. Most things associated with risk taking are receiving healthy buying interest at the moment presenting opportunities for binary betting and fixed odds trading. Last night US markets closed up around 1.5% higher and look set to add to this when markets open this afternoon. European markets enjoyed a strong day yesterday and the FTSE, CAC and DAX have all opened around 0.6% higher in early trading. Commodities, especially crude oil prices are pushing higher on rising confidence that the global economy will start to grow again. With risk taking on the back foot, the dollar and yen are out of favour with the pound and euro enjoying a good start in early trading. The real winners so far today have been the Australian and Canadian dollars, the so called commodity pairs. These countries have economies that are closely linked to the price of raw materials, so with oil holding above $72 and a basket of other commodities such as copper on the rise, their currencies are in play. The Australian dollar recently hit its highest level against the US dollar for over a year, while the Canadian dollar looks to be heading back towards parity with the US. 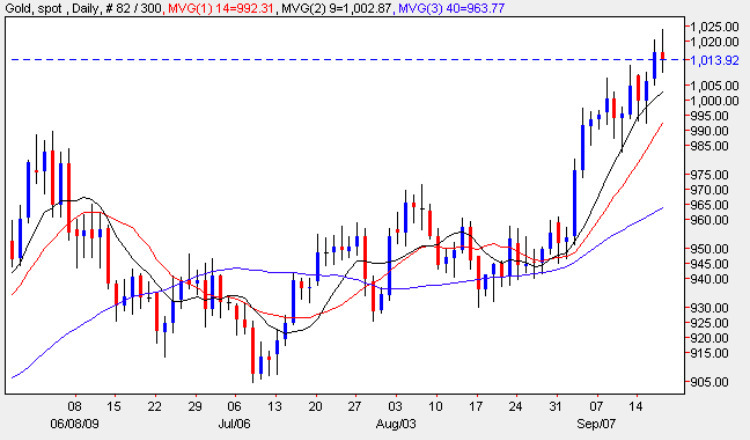 Gold has managed to not just hold above the $1,000 marker, but to climb higher and touch multi year highs of $1022. This has brought a small army of speculators in with the all time high of $1032.60 the next possible target. A One Touch trade predicting that Gold/USD will exceed this and hit $1040 in the next 4 days could return 136% if correct.